So, the inner city is a bit of a drag. A lot of not-so-special-shopping, nice photo opportunities, some swans and a lot of generic food-chain options. And, then there is this little Art Nouveau treasure. Only a few steps away from the City Town Hall (Rathaus) and the Alster. A classic. The grand hall (built in 1882) with its tiled ceiling is nothing short of spectacular. 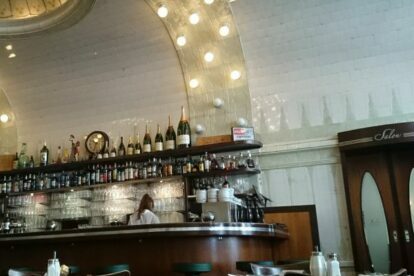 The style and atmosphere are very authentic, the waiters have French accents and are just a bit arrogant. Come here for breakfast, read a newspaper, watch as the local business crowd pours in for lunch and stay until it is time for an Apéritif. This place is always vibrant, even in the evening when the inner city becomes empty. You can’t really go wrong with the food & beverages. The coffee and wine are exquisite. The lunch is always good and reasonably priced. In the evening it becomes a bit more upscale with all the French classic dishes that never fail to impress. Try the Tartare, they are famous for it. A reservation for lunch and dinner is always a good idea. In the evening, try the UPSTAIRS dining room to sit comfortably and more quietly. If you leave the Café Paris with a smile and are still craving a serious drink, right across the street you will find the LE LION BAR. It is a fine upscale Cocktail Bar (Mon – Sat 06:00 – 03:00) with a nice vibe to it. Just knock on the black door.